Our operable or movable walls are the quality option for maximising the use of space within offices, educational establishments and hotels. 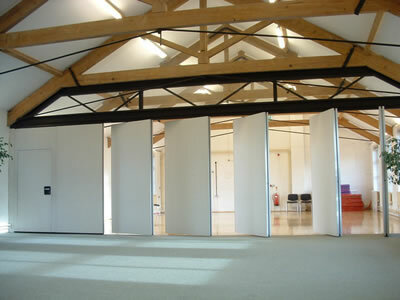 Using a system of individual interlocking panels that once in place give the same quality, aesthetics and sound reduction as a permanent partition wall they are the ideal solution for use in larger areas such as conference and meeting rooms where the space is used for a diverse range of activities. Each panel within a movable wall system can be stored away completely when not in use to maximise the available floor space. Additionally there are numerous ways of stacking or configuring the individual acoustic wall panels to give full versatility on how the area is used. For more information about our operable walls request a quote using our online form or call one of our team on 01373 454577. Whilst widely used within hotel banqueting suites and conference centres with large multi-functional spaces they are also ideally suited for use within offices to give added flexibility to meeting, training and conference rooms. The individual panels can be easily operated by handle or a semi automatic electric system and because they are ceiling hung there is no potential obstruction from floor track to worry about giving maximum flexibility on how the space is used. Our standard minimum panel width is 650mm and the maximum is 1250mm. We can however manufacture non standard sizes if required and can include pass doors or glazing for greater flexibility. There is no floor track with this movable wall system and the high pressure (2Kn) operable seals top and bottom give a 25mm clearance of both floor and head track when fully retracted. The unique track and carrier system uses heavy duty tracks and rollers for added durability whilst also ensuring quiet and easy operation. Both handle operated and semi-automatic electrically operated moveable wall systems are available. Systems can be fire and smoke certificated for additional protection. For further information about our operable wall products download the detailed Product Specification, Technical Drawings or Product Brochure or call our team on 01373 454577. Operable walls are often known as acoustic walls because they offer the highest level of sound proofing available from a semi permanent partition. The individual partition panels are built using an isolated steel frame and a multiple material infill which combined gives an enhanced acoustic performance of Rw 59dB. Our movable wall systems are available in an extensive range of surface finishes to match any existing design and colour scheme. Glazed panels are also available if required. Additionally, why not make your operable wall a useful and functional resource or a key design feature of the room by having a bespoke design printed on it. 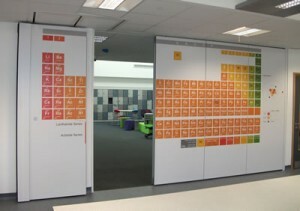 See our recent partition project at a Somerset College where we arranged the inclusion of educational resources on the walls so that they not only enabled the room to be used for multiple purposes but act as a useful teaching aid. “In 2009, Lutterworth Golf Club engaged Building Additions to supply and install a multifold partition to separate the dining room area from the rest of the clubhouse. The work was completed on time and to a very high standard using quality materials. The club decided in the autumn of 2013 to invest in a further partition to separate the lounge area from the ‘19th’ and again used the services of Building Additions for the installation. Read our case studies to see how our operable walls have transformed the space within Writhlington School, Radstock and the Epic Project in Lincolnshire.